Servers | Dragongoserver | An interview with Alexander Popov ("Nicks" on DGS). Ask your questions! An interview with Alexander Popov ("Nicks" on DGS). Ask your questions! Alexander Popov, 6-dan is 2-times USSR champion and currently one of the strongest players on DGS (ID:Nicks). He agreed to answer the questions of GoSensations.com readers. You can ask them here. 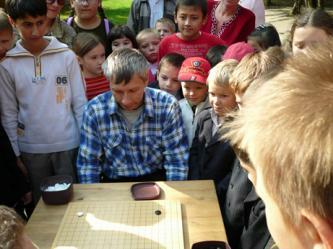 Here you can see one of his best games - he almost beat Kobayshi Chizu, 6p in even game (Japanese Female Honinbo). This game is 25 years old. You can see how big is the playing experience of Alexander. So.. where is the interview ? How do you prepare for an important game? With what attitude do you begin a game you really want to win? How does it feel to go against a proffesional in an even game? Is it hard to deal with pressure in such a game? 1. I can't seem to advance at all...any advice? 2. What do you think is the hardest idea to grasp in go? Is there anything that took you a long time to understand but once you did then you improved noticeably? What would you recommend for a middle/low kyu player to advance to the Dan levels? Any book recommendations for doing so?